Update: If you don’t want to pay $39 for All in One SEO Pack PRO here’s a free alternative that has the exact same functionality. It also doesn’t require that you continue to pay $39/mo for updates. As I installed the All In One SEO Pack (AIOSEOP) plugin on a new site today, I noticed the admin panel was promoting a new PRO version of the plugin. Unfortunately, I was met with serious disappointment after clicking over to WPplugins.com. Apparently Michael Torbert, the creator of AIOSEOP, didn’t feel the need to actually introduce any cool new features before releasing the “PRO” plugin. So what does that $39 (soon to be $69 if WPplugins is to be believed) actually GET you? Why it removes the ads from your AIOSEOP admin panel of course! Call me crazy, but I just don’t think that’s worth $39. As if that weren’t enough, you have to pay an extra $39/per month for support and upgrades! Now I could MAYBE understand someone paying the one time $39 fee to receive support in getting the plugin set up. But those settings aren’t something you should be changing on a regular basis. There really should be NO need for ongoing support, especially not at price of $468 a year! To top it all off, the upgrade process (which was an automatic process with the free version of AIOSEOP) is now a manual process that will be over-written if you accidentally use the automatic upgrade. For those of you keeping score at home, we’ve taken a free plugin, added no new features, removed the ads, removed the automatic upgrade feature, and slapped a $39 price tag on it that explodes into $468 per year if you want support & upgrades. I mean if Thesis would allow control over Tag pages, there’d be no need for AIOSEOP at all, not to mention an expensive but featureless PRO version. If you don’t use tags on your blog, take part of that $468 annual fee, buy the Thesis Theme and migrate all of your settings from All In One SEO Pack into Thesis using this handy tutorial. And, when you consider the $468 annual price tag of the All In One SEO Pack PRO plugin with support & upgrades, the Thesis theme becomes an even better bargain. Personally, I’d recommend taking that $39 and buying yourself a license for the Gravity Forms plugin which, by the way, includes lifetime support & updates. That’s REALLY bad! I saw the plugin on WPPlugins, and I thought how could it improve what was a great plugin. We’re lucky there is a free version at all aren’t we? Adam, we are lucky there’s a free version. It’s one of my recommended plugins. However, that doesn’t make the PRO version any more valuable. Anyone who purchases the PRO version at this point (especially if they pay for a year of support & updates) is being had. You can buy a developer’s license of Thesis theme & Gravity Forms and still have money left over at that price! I’m new to the whole thing and an admittedly ignorant to much of what is discussed on this blog (I’m reading and learning). But this seems to be a simple case of someone trying to take advantage of someone else who maybe isn’t paying attention or who just doesn’t know. Someone like myself for example might not have known what the difference was and paid for this plugin. As I’m learning the ropes, are there any tips on how to avoid getting ripped off? So I’m in the same boat as you man – I love the plugin but he keeps advertising the pro version and I finally just had to ask… what’s the point? And now your post… so… I’ll keep an eye on this and see what comes of it.. hopefully Michael says something. I wonder how many suckers bought it already? Supporting plugin developers is something I’m fine with, but admittedly the plugin owner could’ve handled this one better. There are other plugins that do the same thing for anyone that isn’t using Thesis. I actually never moved to All in One SEO and instead just SEO Title Tags and one or two more to achieve the same results. Marios, I’m right there with you. I don’t mind supporting plugin developers or even premium plugins. I don’t mind if they have ads in the admin panel or anything like that. But to charge for something that you can get for free (from the exact same source) doesn’t sit well with me & $39/mo for support & updates is outrageous! Light SEO is ripped version of All In One SEO and you can have All In One SEO for free as well, see the only difference between the free and paid version is that free one comes with two small banners listed under the plugin option page, that’s all. I use this plugin since the launch and never had a single problem with it. And also very happy with free version, who cares about the banners, they don’t bother me at all. I paid the $39 but the plug in is faulty and does not work. I even approached the plug-in creator on his website and asked for support but got none. I have requested a refund. On principle I will not use the free version either. @Johannes, how was the plugin faulty? Most people won’t offer refunds on digitally downloaded products since you can’t return them like you do a normal product. I’m not sure if AIOSEOP Pro will do that or not but I certainly wouldn’t. In my opinion, Platinum SEO plugin is the best free plugin to use. Unlike AIOSEOP, this plugin releases only when revisions are genuinely made. i.e. when new functionalities are added. AIOSEOP keeps releasing newer versions without any new functionality.This is a strategy to increase the wordpress download count and Michael does that too often.Michael hadn’t introduced anything new in this plugin, that is worthwhile, since he took it over from original author of AIOSEO. Now he releases a pro version without anything new and making buyers feel cheated. Great article! I was just going to purchase it and then I decided first I should do a google search. This was the first site on the search, how ironic! Glad I stumbled on this page. Thanks buddy! Thanks for the share. I cant believe what was an amazing and free celebrated plugin is now useless to me. When you update it, all the Post Title Formats etc. go blank and you have to fill it in yourself now. Thank for advice, Ben. I was considering to buy a pro version, but did not find any extra features in it. What point to spend money, if you don’t get extra value? Thanks for clearing that up–I wasn’t missing anything! that being said, I’ve purchased this plugin and not been particularly impressed over the free version. it’s offered me a bit of help in dealing with WP e-commerce, but otherwise, I have no reason to recommend going pro. Furthermore, i’ve posted and emailed for support and gotten nothing… so what exactly am I paying monthly for?!?!?! I’m in the process of making sure paypal sees fit to discontinue that support subscription because it’s a waste of money. Phil, it was $39 per month when this post was published but it does seem to have been updated. Even still, as you said, there’s really still no added value over the free version or the multiple free forks that are out there now. Plus, the Thesis theme now has 100% of the functionality that I used this plugin for, already built in. So thankfully I don’t have to worry about it, or support and upgrades at all! Thanks for the post. Glad to see someone is looking out for our best interest ;). 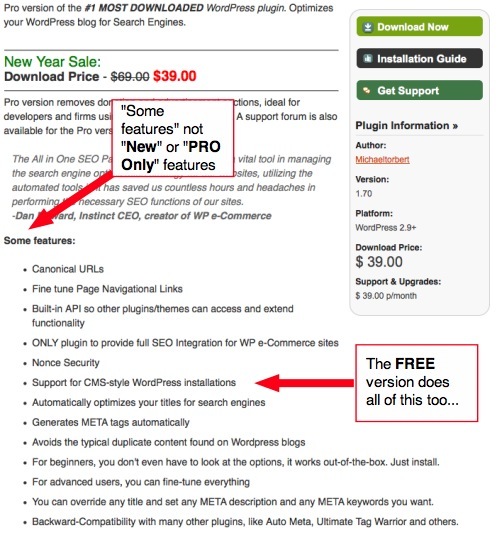 I have used AIO SEO for some time and then I saw the promotion for the Pro version. It implied that it would automatically create titles and mega tags etc. Great, I thought, and bought it to save myself hassle. $39 plus one year at $49. It doesnt do anything and so I thought I hadnt got it right BUT from what you guys are saying, it DOESN’T do anything extra. I wrote today asking for a refund and was refused. As I bought through Paypal I am going to take it to the Resolution Centre. I don’t have enough money to be conned like this. I assume Jacob is talking about the alternate link you’re talking about, Ben! Its LIGHT SEO plugin.. So, I was browsing through all in one seo pro review and of course, this topped the result and made me happy. Thanks for the alternative, right now, I am not using any seo plugin but will use LIGHT SEO. Wondering whats your take on the plugin? I did take it to the Resolution Centre at Paypal but all they are interested in is “delivery”. The quality of the item delivered doesn’t come into it and so it is very much “caveat emptor”. The whole experience was made worse by the attitude of the guy running the Sales site for the plug-ins. He was very unpleasant and downright sarcastic. So much for internet marketing being about building relationships. Thank you a lot. I save 39$ because of you. I think the author should me more clear about the difference between the pro and free version. For the price of the support, it is too expensive. I will check the Gravity Forms plugin you advise. I was going to buy the pro pack because I thought it would help with WP-e commerce. I have the free version installed and a different plug in made for e commerce and neither of them has allowed me to change any seo on products. It has worked good on blog posts but thats about it. Anyone know of a plug in that will work with posts and products with wp-e commerce? I think you jinxed the free plugin 🙂 – as of the latest version, it doesn’t seem to automatically create titles and descriptions for new posts :-(…. I should have read this before…..my bad luck…i purchased the plug in and then read it…atleast i saved one year subscription of 49 USD. We wish we would have read your post before purchasing the pro version! No one has responded to our contact or forum questions, and the pro version does not have the features it claimed! The problem is, there is no direct way to cancel, even though it says you can cancel on the upgrade page. Has anyone had any luck cancelling their account? Or do we need to dispute with PayPal? So frustrating!!!! I bought it, hoping that it would add valuable SEO to my blog. Safe to say I feel cheated. Im trying to claim it back in PAYPAL, but it doesn’e qualify. 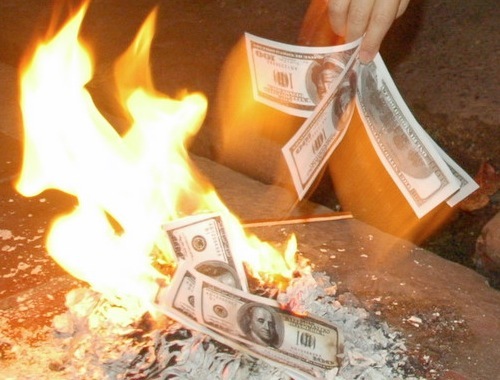 So I just paid 39$ for not having ads on the all-in-one SEO options page…. I could sure use the 39$ myself.